Rising infrastructure development, expansion of power transmission and distribution network along with ambitious transportation projects would fuel the growth of Thailand switchgear market during the forecast period. Additionally, large-scale infrastructure and power sector development plans such as the transport infrastructure development master plan 2015-2022 as well as the Thailand Power Development Plan 2015-2036 are expected to further increase the demand for switchgears in Thailand over the coming years. According to 6Wresearch, Thailand switchgear market size is projected to grow at a CAGR of 4.0% during 2018-24. According to Thailand's Alternative Energy Development Plan (2012-2021), Government aims to generate around 6.83 GW from renewable power generation sources such as solar, wind and biomass by 2021. Further, government of Thailand also plans to reduce power generation dependency from gas based power plants to other power generation sources such as hydro, coal, solar, wind and biomass, which would also lead to the growth of the switchgear market in future. Low voltage switchgear segment acquired highest market revenue share in 2017 among all other types due to their high consumption in commercial and residential sectors. Further, by application type, power utility captured the largest revenue share in Thailand switchgear market share in 2017 followed by Industrial sector, due to high consumption of low, medium and high voltage switchgear in power utility segment. Additionally, government initiatives such as Thailand 4.0 and power development plan 2015-2036 would also fuel the market of switchgear during the forecast period. The Thailand switchgear market report comprehensively covers Thailand Switchgear Market by voltage, insulation, types, applications and regions. 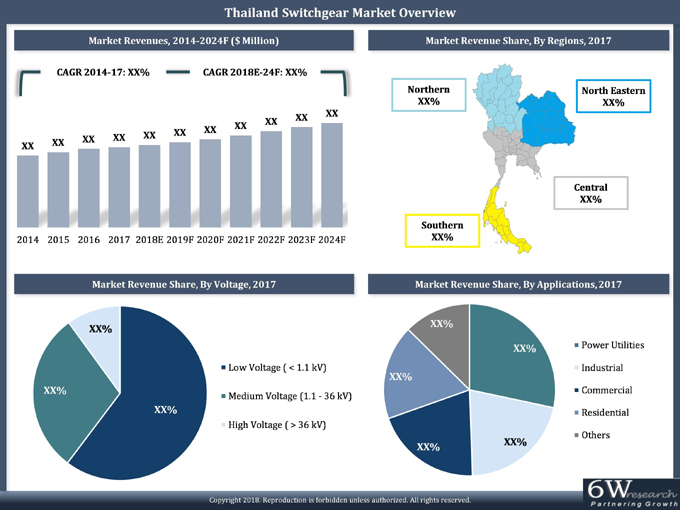 The Thailand switchgear market outlook report provides an unbiased and detailed analysis of the Thailand switchgear market trends, opportunities/high growth areas and market drivers which would help the stakeholders to device and align their market strategies according to the current and future market dynamics. 14.5 Fuji Electric Co., Ltd.
14.10 Hyundai Electric & Energy Systems Co., Ltd.